The Damascus version of Ice will go on sale October 1st at 12 Noon Eastern US Time. There tends to be some competition for ordering these products and so we’re announcing the exact date and time in advance. The first person ordering will get dibs on #2, the second dibs on #3, and so on. You can request a higher number than you’re order slot, but not a lower number. #1 will be auctioned on eBay soon. If you plan on bidding in the auction we still recommend purchasing a sword in this release, if you win the auction you we will then just switch your number to #1. If you do not win the auction you would still have a fall back though. The order page is up now so you can view pictures and product information. But it isn’t able to be ordered from yet. Hello. I see that the Damascus Ice is high carbon damascus steel. Is that 1060 damascus steel like the Damascus Longclaw or maybe even 1070? Also, the blade of the Damascus Ice will be two inches longer than the normal Ice? Thanks. same metal as the longclaw variant, and yes, it is 2 inches longer. 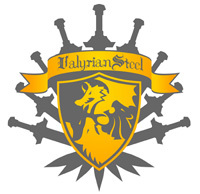 My first product from Valyrian Steel. Ice is my favorite sword from the series so after some debate I decided to go for it. I got in at 12:02. Tomislave, you are pretty much guaranteed 72 I think. This early, I would guess that we are looking at numbers in the early teens . . . Speaking of, when will we know what number we got in on? I’m curious of course. Here are the first few minutes of orders. Remember, order 1, actually gets #2, and so on, possibly moving up one digit if the person who wins the auction is above you in the order list. Grant B. won it last time, so if he did it again everyone above 3 would get their actual number (unless requested otherwise). Also, if someone who orders lower requests a higher number (for whatever reason) you could move down. Ordered and paid for!! Can you update the ordering numbers again and is shipping scheduled for November of this year? Thank you! Jamie you’re like the 58th order. And yes, that is November of this year. They’re actually all almost done. The time till November is just shipping and logistics. Wow, looks like these have been very well received. I shouldn’t have left it an hour to get an order in. Any idea where I got in? Is the Damascus version of Ice battle ready? Damascus being our worlds valyrian steel will the edges of the blade be sharpened before delivery? Damascus steel is considered a functional steel by those who consider such things. There is no such thing as a sword that is impervious to damage and we do not warranty any of our swords for any sort of combat. I personally would not want to ding up so valuable a blade. They also do not come sharpened for various legal reasons. But you can have it sharpened professionally once you receive it. You guys can just mail my sword. I have never been one for “logistics”! Can’t wait!!!!! Do you know my number? Just out of curiosity, how are sales for Damascus Ice coming along? It would seem as though they are much stronger than LongClaw was in the beginning? Hi Valyrian! Would you please update the customer rankings? We are all so anxious. took that off the facebook page. Tomislav, you can request 72 as long as nobody takes it before you. May I request number 77? Read what it says at the top of the page. Just ordered mine,can one of them be #88 please. Any update on when Damascus Ice is shipping? I thought it was supposed to be some time in November?